Ten yards from the other side of my living room window sits a persecuted shrub. His leaves are the simplest of green and his growth habit sturdy and upright. He is difficult to wound and almost impossible to kill, yet I have treated him shamefully for years – apologizing for his lack of finesse, omitting his name during garden tours, and directing precious water elsewhere in times of drought. 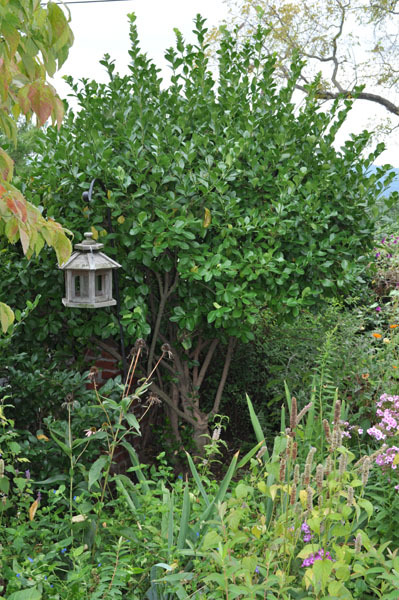 He is a Manhattan Euonymus, the commonest of common shrubs – and this is the story of how I finally fell in love with my humble bit of greenery from the wrong side of the tracks and re-examined the reasons why I shunned him for so long. The tale of how we met is a familiar one, beginning in the parking lot annex of a big box retailer one spring five years ago. He was cheap, as so many impulse purchase plants are, and I was looking for more evergreen oomph in the mixed border – without sacrificing square footage to greedy conifer roots. It’s true that he didn’t excite me the way that my blue Ceanothus had done in the spring of ’03; but he was reliable, and didn’t disappear like that pretty bad boy the moment times got tough and winter offered up its usual fare of sub-zero temps. So I tried to forget that I was breaking about fifty rules of advanced horticultural snobbery by even allowing one of his roots to infiltrate my precious soil. Last year I turned him into a tree in an effort to reconnect – it worked for awhile, but I soon felt the old feelings of apathy when I would look up from the weeding and find him looking at me dejectedly. We all carry prejudices of one sort or another around with us. Human beings compartmentalize people, places, and things into categories, no matter how enlightened the thinker. Gardeners are particularly adept at these groupings, and if you let yourself be drawn, ever so slightly, into any type of gardening circle that discusses plants like fine bottles of Burgundy, you will soon start to understand that there is a certain group of plants considered beyond the pale – plants that are sneered at when the poor homeowner isn’t looking. What is it that designates these innocent plants as horticultural pariahs? I wish I could say it has something to do with their invasive qualities, unpleasant appearance, or revolting odor – however the truth is far simpler and much more embarrassing. Once you’ve been gardening for awhile, you can walk one of two green pathways: either embrace and enjoy the plants that spring, Phoenix-like out of the soil and reward you with fruit and flowers beyond your wildest dreams, or rather, dismiss them out of hand, and sadistically look for plants that hurt you, disappoint you and generally spit on you 80% of the time. Who wants to plant something so easy that everyone can grow it? And it doesn’t come much easier than Euyonumus kiautschovicus ‘Manhattan’. Beloved of urban landscapers and no doubt planted in McDonald’s parking lots as far afield as Mumbai, it has become a thing of derision for those who hover in the higher circles of horticultural society. I always thought I trod the first path of righteousness, but it seems I have been stumbling a bit. During the first few weeks of my convalescence after an accident, I watched this slighted shrub, now a quiet giant, with eyes firmly closed to his charms. A broken hip had erased any chance of a change of scenery and my living room window became as a television set to me, starring one of the most unpopular actors on the green screen. But Mother Nature had a few tricks to play on this gardener who felt herself above the allure of a plant she had been taught to term ‘ordinary.’ It was the month of July, and as the days drew on, the green waxy leaves of my euonymus shone amongst other less heat resilient foliage. Stronger and brighter he grew, welcoming the heat and weathering any signs of drought. Although the blooms of the Manhattan Euonymus are described in most plant guides as ‘indistinct,’ it seems that this designation matters little to those that make their living seeking nectar. The little tree exploded into a mass of tiny white panicles of blossom and flying creatures came from far and wide to sup and spar with one another in a whirling circus of activity. Day after day I would watch the dramas unfolding. Bee chasing wasp; bird chasing bee – all chasing the promise of nectar, or an easy predatory meal. 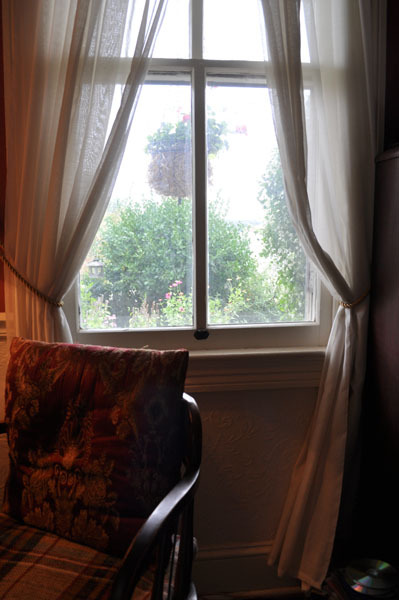 Day after day I grew fonder of this garden anchor, surrounded by the extraordinary hum of life and framed exquisitely by the panes of my hundred year-old window. And then I was well again. Well, and weeding the soil around his trunk-like stems…or gazing from the opposite corner of the garden…or sneaking a peak out of the corner of my eye at my handsome dark horse of a shrub. Who knew I could fall so hard? Well, it turns out that the birds and the bees did; but then, I doubt they have ever suffered from snobbery. Shame on me. LOL! I am so glad this romantic comedy had a happy ending. He is beautiful especially from that window. I can see how he overpowered you with his charms. Well photographers like to say that the best camera is the one that you have with you when that perfect moment arises. I suspect too that I would always take horticultural delight in that which is available. But given the choice, I’m probably going to choose the elegance of a true English boxwood (Buxus sempervirens ‘Suffruticosa’) over the Euonymous 100% of the time. The look and feel of fresh green growth of the boxwood in the springtime is not to be missed. And each of our box plantings has been carefree over decades even when planted in the most difficult conditions.